Greeted with some sangria, which was unfortunately, more lemonade than wine, it was the first time we’d been in this particular branch – La Tasca is of course, a chain restaurant with 40+ locations in the UK. The Quayside branch looks as you might imagine, identical to the others. Note to chain restaurants – a bit of variety goes a long way to bring out some personality. Soon enough the local head chef was joined by Antonio, who is somewhat amusingly, of Italian descent. 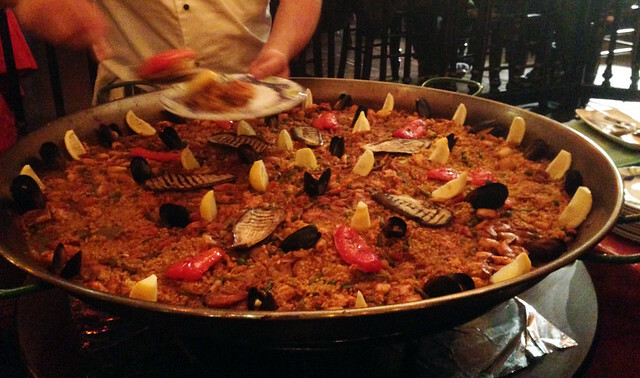 He took us through the “classic” way in which La Tasca makes paella valenciana. Interesting to watch, and he seems genuinely passionate about food in general, which is good to see. Chicken, squid, saffron, pimenton – all the usual stuff goes in. Smells pretty good though. 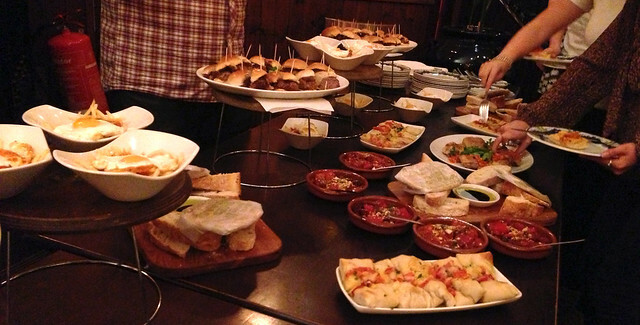 As we waited for the paella to rest, a whole load of tapas came out – ranging from meh (Cataluña beef burgers), to pretty unexpected/interesting (slow cooked pork cheeks). A pretty varied mix but as you might expect, hit and miss. Flatbreads are good, as is the black pudding; chorizo could be way better, ditto the duck. On return I think we’d stick with the paella, which was honestly, surprisingly good – a great consistency, with perfectly tender rice, prawns and chicken. Totally didn’t expect it to be so good. We also get to try arroz negra which just doesn’t have the satisfying depth of flavour as the main paella, but is a bit of a different experience nonetheless. We were sent away with one of the best goodie bags of all time – a paella pan with calasparra rice and a few other deli items – and unexpectedly, a bit more of an open mind on large chain restaurants. Immediately inspired, we have tried the paella recipe already; it is simple, and satisfying. All the same, would definitely still like to return to La Tasca to see if the common customer gets paella as good as we did. What do you make of chain restaurants? Will they always have a place?